I am no coder. I do not now any programming language but I hear of them. The latest for me has been Ruby: a programming system. I did not know about it until I attended the Rails Girls Kampala meet put together by ThoughtWorks Uganda and Girl Geek Kampala. Interesting to note though is that I was not alone. There were some girls that had never done any programming too. Meet Patricia Opio. She was one of the participants of the first ever RailsGirls Kampala. website.” Now that is quite some resolve I must say. Girls busy coding at Outbox Hub last Saturday. Engineer be doing at a coding event, you may ask? Kellen explains: “I had gone to a friend for software to use for coding for my final year project. And because I am not into coding, I was looking for a user friendly program. That is how I got to know about this event. And I am glad I came, I found it a little easier. Actually I found that coding is not that hard. code, same strings that we usually write, so U don’t have to fear it.” Is it that easy? So, do you sometimes doubt your ability to do something: well, don’t. Do not anyone till you otherwise. It can be done. The event put together last Saturday was hosted by OutboxHub and it brought together about 50 girls. Which was quite overwhelming for the organizers. Thought Works is an IT consulting company that believes in software’s liberating capacity for society, attacking the most pressing problems of our time: social and economic inequality, the environment, energy, health care, participatory democracy, increasing the effectiveness of economic activity, reducing drudgery as well as ushering in the as yet undiscovered. Inspire the next generation of girl geeks to get involved in tech by equipping them with the basic programming skills. 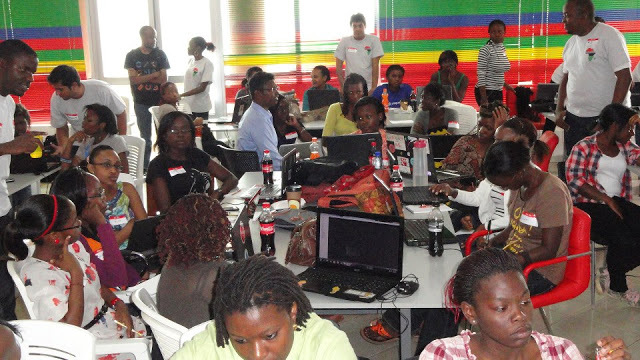 get more girls into the growing tech scene in Kampala. Planning on doing something different this year? Well go ahead and do it! Let no one stop you. Rails Girls Kla was AMAZING!! Thanks for the recap Ruth! Am excited about this program. How do I join?